As of today, I’ve officially been calling The Homegrown Studio my full-time job for one whole month. Making the leap to freelancing full-time has been exciting and sometimes uncomfortable, but ultimately I can say I am feeling a whole lot better, happier, and more fulfilled than I was a month ago. Heck, I’m even making money. I’m surprising myself in new ways every day, and thought I’d share some of the things I pushed myself to do as I set out on this new chapter. 1. I asked people to tea. (I don’t drink coffee!) The first thing I decided to do when jumping fully into freelance work was to turn the networking way up. I did this for two reasons: 1.) I felt in need of advice and work and ideas, and 2.) I was terrified of being lonely - about two days into freelancing I realized that this could easily get very lonely. So, I reached out to mentors and smart ladies I’d met along my career path and asked if they would meet up with me. They had nothing but great ideas and sound advice, and it was great to catch up. I threw invitations out to local people I admired and was curious about, but had previously only made contact through mere Instagram likes. Why stay behind the screen? I gained new perspectives and new friends in this case, which was so exciting. Here’s the awesome thing: no one turned down my invitation. Everyone I had tea with seemed genuinely happy to sit down and chat in person, and real, engaging, pleasant conversation always resulted. 2. I started something new. 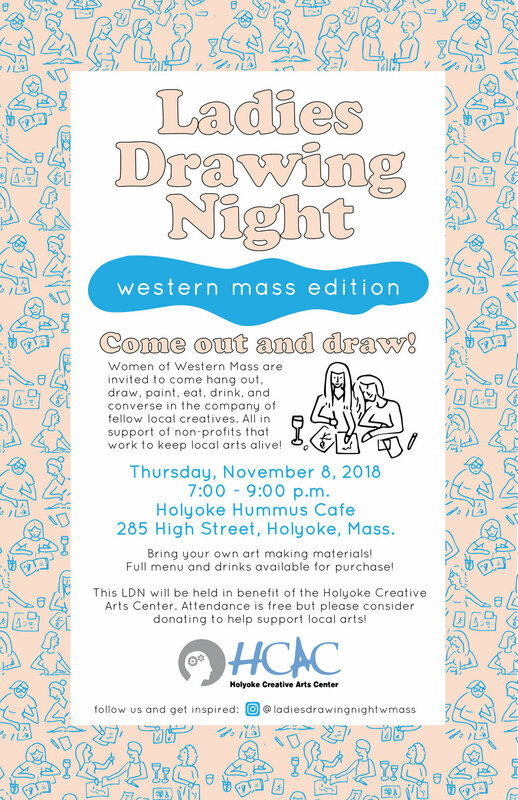 Out of this urge to connect with others originated the idea to bring a Ladies Drawing Night to Western Mass. I put the idea out there, set a date, found an awesome host, started an Instagram account, and put up posters. I was thrilled to see tons of women I barely knew were excited about this, and said “see you there!” it’s been fun learning how to make a community event happen and create all the branding around it as a neat personal project. I can’t wait for November 8 when we can all just meet up and draw! 3. I set measurable goals. At my corporate job, the practice of setting clear and measurable goals was hammered into me. It could get annoying, but there’s no denying it consistently worked. Freelancing, I found myself going back to that ritual and making lists to prioritize tasks for the day, week, and month. Every Monday, I identify one thing I nailed last week, and three things I absolutely need to nail this week. Long term, I’ve started thinking about where I want to be in a year – three years – and I’m setting a timeline as to when I need to achieve smaller goals to make it all happen. I’ve been trying to stay disciplined about this, even as I’ve thrown a lot of my corporate structure out the window. 4. I reached out to dream clients. I’ve realized quickly how important it is to be cultivating new opportunities even as I’m working on the here and now. When I was freelancing by moonlight, I could kind of get away with being passive about this and rely on clients coming to me, no big deal if they didn’t. Full time, I really want to make sure work that I’m excited about is coming in consistently. I took some new tactics such as sending out postcards to people and businesses I would love to work with. I’m finding myself busier than ever, and with more of a plan to make sure it continues. 5. I set a schedule for myself. Well, still working on this one. The line between work and life has become blurry, although I’m loving the flexibility of working from home on my own terms. Knowing when to sit down and do nothing but work, when to run errands, when to go to the barn, when to visit my grandmother, when to schedule meetings with clients, and when to watch American Horror Story with my boyfriend has been challenging. I wonder at the end of each day did I do enough? I’m finding it difficult to shut off my brain and relax, something I had no problem doing with the corporate job. Setting those measurable goals has helped with this, and as I get a feel for this new lifestyle I’m getting a better picture of what ‘normal’ looks like, and when enough is enough. It’s an adjustment, and something I suspect I’ll always grapple with as so many other freelancers have advised me. There are still plenty of things I am wrapping my head around and learning (Quickbooks anyone???) but I’m feeling pretty darn good one month into the game. I am thrilled to be able to finally devote myself fully to my dream, focus my work entirely on my clients, and give this my best shot. I’ll update you on how it’s going at six months, and in the meantime, just let me know if you’d like to get tea! I’ve been feeling like talking in real life with other local creatives; exchanging ideas, learning about others’ processes, getting feedback, and enjoying a laugh together at all of this. I’ve long been inspired by the original Ladies Drawing Night movement in Brooklyn, and loved the book by Julia Rothman, Leah Goren, and Rachael Cole. So I put a little idea out there on Insta, and was thrilled to see an enthusiastic response both from people I know and don’t know, and local businesses offering to host. I fleshed out the idea a little more from there and came up with Ladies Drawing Night Western Mass. 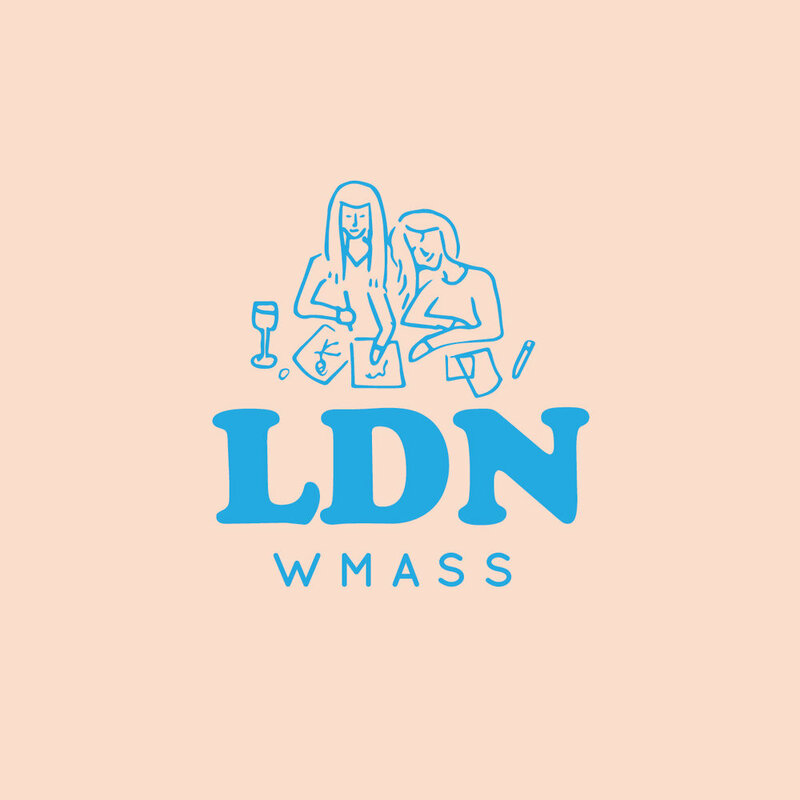 The first LDN will be Thursday, November 8 from 7:00 - 9:00 pm at Holyoke Hummus in Holyoke, Mass.! It will be a fun, casual atmosphere for local creative women to make some art, share ideas, get inspiration, make new connections, and enjoy the best falafel in the Pioneer Valley. And, this will all be in benefit of the Holyoke Creative Arts Center, which provides low cost artistic instruction to the Holyoke community and beyond. They do a lot to support local arts and foster creative thinking in the community, and we’d like to show our support in return. Please consider donating when you come out to Ladies Drawing Night. So, put LDN on your calendars, and I’ll look forward to seeing you on November 8! Can’t wait to meet you!